Fall in love again. Let your heart beat a little faster and become swept away with the radiant romance of this exquisitely enchanting handbag by Giuseppe Zanotti™. 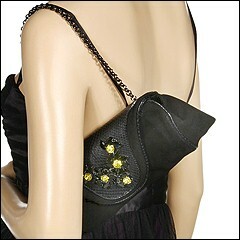 Satchel style shoulder bag made of luxe leather. Holds your wallet, keys, sunglasses, lipstick and personal technology. Cut colored crystals are prominently positioned in dazzling floral shapes on the front. Single shoulder chain. Shoulder drop: 7 1/2 length. Platform bottom. Inside magnetic snap closure. Giuseppe Zanotti interior lining with a back wall zip pocket. Dimensions: 11 wide x 2 deep x 5 high. 11.00 oz. Made in Italy. Free shipping in the USA.